Always elevated when urine FLCs are elevated. Diagnostically more sensitive than serum immunofixation electrophoresis. A better indicator of residual disease than urine measurements. Able to indicate disease changes more accurately than urine measurements. Typical clinical features including bone pain, fractures, renal failure and anaemia may alert the physician to a possible diagnosis. Bence Jones protein in the urine, in the absence of intact monoclonal immunoglobulins in the serum, alongside a positive bone marrow biopsy, confirms the diagnosis of light chain multiple myeloma (LCMM). On occasions, symptoms and signs can be so obscure that urine tests for LCMM are not considered for some time. This leads to delays in diagnosis, as indicated by occasional published case reports , and illustrates the difficulties facing clinicians (Clinical case history 1). Drayson et al. characterised 2592 MM patients enrolled into multicenter myeloma trials and concluded that LCMM is associated with distinct clinical features. Firstly, LCMM patients tend to have a worse outcome compared to IgG or IgA patients (overall survival 1.9 vs. 2.5 or 2.3 years, p<0.001), which is thought to result from the higher levels of FLC excretion and higher incidence of renal failure in this group (Section 20.1). These results were confirmed by a subsequent study . Furthermore, LCMM patients tend to be younger, with worse performance status and more lytic lesions compared to IgG or IgA patients . Drayson et al. comment that this may reflect a failure to send urine to the laboratory resulting in delayed diagnosis for LCMM patients who have no detectable serum monoclonal protein (Section 24.4). Historically, the initial screening test for LCMM was commonly serum protein electrophoresis (SPE). This reveals a monoclonal free light chain (FLC) band in around 60% of patients  and may also show hypogammaglobulinaemia . Serum immunofixation electrophoresis (sIFE) demonstrates monoclonal bands in most patients but ultimately a more sensitive test is required to identify and quantitate the monoclonal FLCs. Additionally, urine protein electrophoresis (UPE) and urine immunofixation (uIFE) has also been necessary, however monoclonal FLCs can also be measured in the serum using serum FLC (sFLC) immunoassays. Figure 15.1 shows some typical electrophoretic test results alongside the associated sFLC (Freelite®) results. Since sFLC assays are more sensitive than electrophoretic tests (Chapter 4), and considering the difficulties associated with urinalysis (Chapter 24), could urine tests be avoided when a diagnosis of LCMM is being considered? The answer to this question was published in The Lancet in 2003 as a clear “Yes” . This study was based on archived sera from 224 patients with LCMM entered into the UK MRC Myeloma trials between 1983 and 1999. The clinical diagnosis of LCMM had been established using bone marrow plasma cell content, the presence of monoclonal FLCs in the serum or urine (in the absence of intact monoclonal immunoglobulins), and the presence of lytic bone lesions. At the time of diagnosis, all patients had an abnormal concentration of the appropriate sFLC and an abnormal κ/λ sFLC ratio (Figure 15.2). The non-tumour FLC concentrations produced by normal plasma cells were also abnormal in a high proportion of patients. Some were elevated as a result of renal impairment while others were low because of bone marrow suppression. In The Lancet study , all patients had elevated concentrations of both serum and urine involved FLCs, so it might be expected that the two variables would be highly correlated. In fact, there was only a modest association (Figure 15.3), which has been confirmed by others . This may seem surprising, but can be explained by the effect of the renal tubular metabolism of FLCs. The amounts of FLCs observed in urine are highly dependent upon renal function. When renal function is normal, the proximal tubules remove 20 - 30 g of protein per day (Section 3.5.2). Hence, serum and urine FLC concentrations are frequently discordant, with serum being more representative of tumour mass than urine concentrations. The amounts of sFLCs required to produce an abnormal urine test is discussed in Section 24.2. In 17 independent studies, which have included 805 LCMM patients, an abnormal κ/λ sFLC ratio was recorded in 100% of diagnostic samples (Table 15.1). Only one study has reported a patient with a normal sFLC ratio at diagnosis . In this case, although the involved λ sFLC concentration was highly abnormal (715 mg/L), an elevation of the uninvolved κ sFLC to 231 mg/L resulted in a normal ratio (0.32). At the next measurement (one month after diagnosis) the patients uninvolved κ sFLC concentration, although still abnormal, had dropped considerably to 99 mg/L. The λ sFLCs were still very high (686 mg/L) and the patient had an abnormal sFLC ratio (0.15), confirming the presence of monoclonal λ sFLCs. The reason for such a significant polyclonal elevation of the patient's FLCs at diagnosis was unknown to the authors (T. Jeong, personal communication). Table 15.1. sFLC measurements in studies of LCMM. Jeong et al. also assessed the diagnostic sensitivity of serum- and urine-based methods in screening panels for detecting monoclonal proteins. In their cohort of 231 MM patients, 49 (21%) had LCMM. 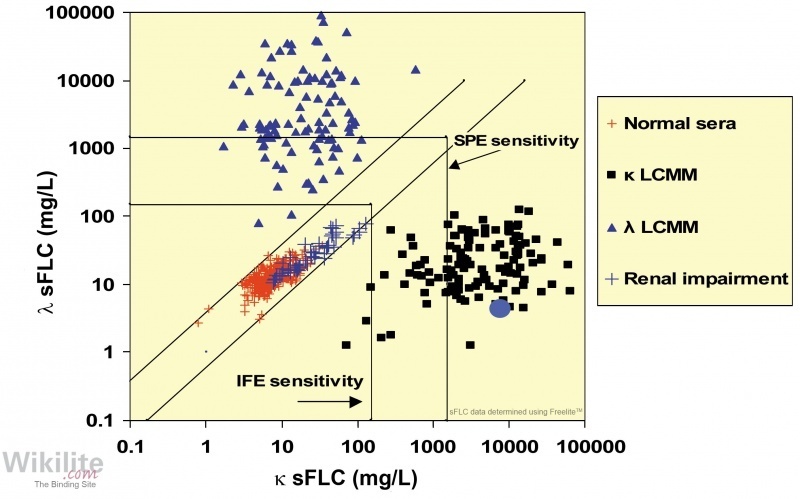 The sFLC ratio alongside either SPE or sIFE were the only combinations that gave a diagnostic sensitivity of 100% for LCMM. By contrast, SPE in combination with UPE or uIFE gave a diagnostic sensitivity of 85.7% and 91.8%, respectively for LCMM. These results, and those of Katzmann et al. , highlight the benefits of a serum based screening algorithm for the detection of monoclonal FLCs (Chapter 23). The sensitivity of sFLC analysis in LCMM patients is now reflected in International Myeloma Working Group (IMWG) guidelines , which recommend the use of sFLC assays in combination with serum electrophoresis to screen for pathological monoclonal plasma cell proliferative disorders, including LCMM (Section 25.3). IMWG guidelines also include sFLC analysis as a “biomarker of malignancy” in the revised definition of MM (Section 25.2.1). 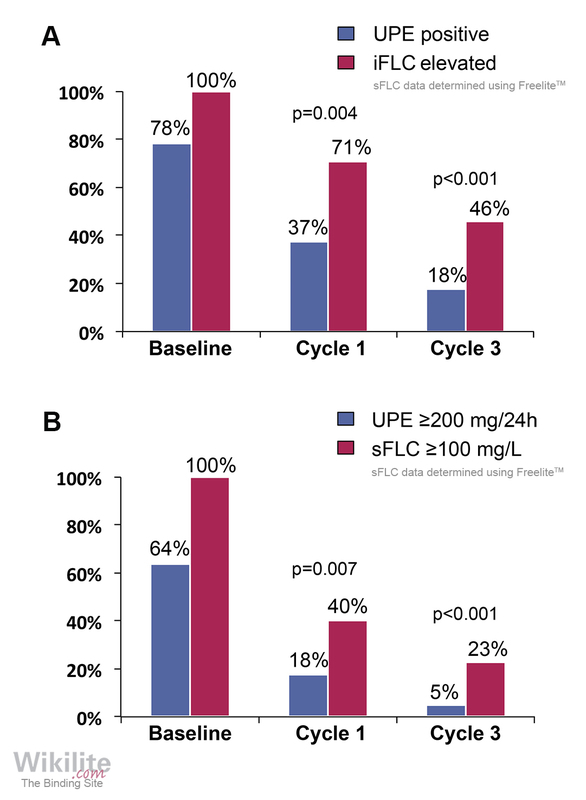 However, monitoring with sFLCs is currently only recommended for selected MM patients, in whom other markers are below measurable concentrations (≤10 g/L serum M-protein and ≤200 mg/24 hr urine M-protein), provided their iFLC concentration is ≥100 mg/L. Lopez-Anglada Fernandez et al. compared the use of the sFLCs and urine electrophoresis in 169 LCMM patients enrolled in GEM/PETHEMA clinical trials. At diagnosis, a similar proportion of patients had measurable disease by iFLC or urine M-protein measurements (95% vs. 96%). In contrast, a survey of 113 LCMM patients enrolled in the IFM-2009 trial, Dejoie et al. reported that the number of patients with measurable iFLCs was substantially greater (100%) than those with measurable urinary M-proteins (64%) (Figure 15.4). In both studies, sFLC measurements provided valuable prognostic information, and is discussed further in Sections 24.8 and 20.3.1. Unusual clinical features in a patient with LCMM. A 63-year-old woman attended hospital with severe pain in her right shoulder. An X-ray showed minor erosive changes in the shoulder joint while blood tests were normal apart from a marginally elevated serum calcium of 2.69 mmol/L (normal range [NR]: 2.08 - 2.67). An orthopaedic surgeon recommended a hemiarthroplasty. At operation, the head of the humerus was eroded and the glenoid was almost entirely replaced by 'extremely soft bone' suggestive of malignancy or a metabolic cause. The operation was aborted and the tissue was sent for histological examination. Re-examination of the patient failed to identify any additional clinical features. Investigations showed a normal chest X-ray while the serum calcium had increased further to 3.41 mmol/L and she was hypophosphataemic at 0.55 mmol/L (NR: 0.67 - 1.54). Other results included a raised alkaline phosphatase at 234 IU/L (NR: 30 - 115) and an increased parathyroid hormone-related peptide at 9.5 pmol/L (NR: 0.7 - 1.8) while parathyroid hormone levels were low at 9 ng/L (NR: 10 - 60). A metastatic tumour deposit was considered the most likely cause of her shoulder disease. The search for a primary tumour, however, was unsuccessful: CT scans of the abdomen and thorax were normal, as were the serum cancer markers, CA-199, CA-125 and CEA. The possibility of multiple myeloma (MM) was considered. Bone histology from the surgically resected specimen showed osteoarthritis and osteopenia and there was no excess of plasma cells. A skeletal survey showed only osteoporotic bone with no discrete lytic lesions and no features of MM. Serum and urine electrophoretic tests showed no monoclonal gammopathy but assessment of immunoglobulins by nephelometry revealed hypogammaglobulinaemia: IgG 3.20 g/L (NR: 5.3 - 16.5), IgA 0.15 g/L (NR: 0.8 - 4.0) and IgM 0.26 g/L (NR: 0.5 - 2.0). In view of the diagnostic difficulties, sFLC measurements were requested, with the following results: κ 7,840 mg/L (NR: 3.3 - 19.4); λ 4.4 mg/L (NR: 5.7 - 26.3); κ/λ ratio 1,782 (NR: 0.26 - 1.65) (Figure 15.5). Urinary FLC concentrations by immunoassay were as follows: κ 371 mg/L; λ 4.7 mg/L; κ/λ ratio 79. Subsequent bone marrow aspiration of the iliac crest indicated a high concentration of abnormal plasma cells. This established the diagnosis as κ LCMM with production of excess parathyroid hormone-related peptide leading to hypercalcaemia. Several months after her initial clinical presentation, the patient was finally treated with chemotherapy. This resulted in a satisfactory reduction of the serum κ FLC concentrations and normalisation of serum calcium. Since then, her shoulder has remained unstable although pain free. Comment. The diagnosis of LCMM can be difficult. In this case the clinical features were atypical and did not provide a clear suggestion as to the diagnosis, so tests for MM were not considered for some time. When electrophoretic analysis of serum and urine were eventually performed, the results showed no monoclonal proteins. Re-assessment of the original urine sample, showed a low concentration of monoclonal κ FLC by IFE, which had been overlooked on the earlier analysis. The final diagnosis was LCMM with limited plasma cell infiltration of the bone marrow. 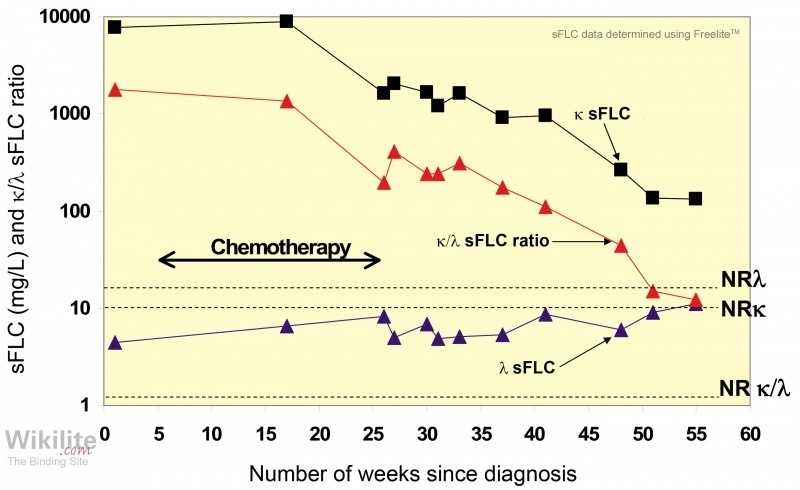 The response of the tumour to chemotherapy was good; serum κ FLC concentrations decreased for 45 weeks with a half-life of approximately 4 weeks (Figure 15.5). The patient is likely to have a good clinical course in the medium term.